Matar ka nimona is a favorite recipe of all the matar (green peas) lovers and the best taste comes in winters when farm fresh tender peas are available. Frozen peas are somehow not as good, though they can be used as a substitute. What is so great when we make nimona is winter season? In fact the flavor of tender peas is extremely rich, sweetish and minimum seasoning is needed, the taste is beyond comparison if you ask me. Whenever I use the frozen peas, I make it using onion-garlic and a bit more garam masala, so this one turns out a spicy recipe and goes well with rice or chapati. I am giving both the recipes here as both of them are different in taste and preparation. I would tell you what a matar ka nimona is, as the name is quite unusual and it doesn't sound like a curry that it really is. I eastern UP, any curry that is cooked with a lentil paste (preferably fresh seasonal green lentils I repeat) to make a thick daal like gravy is called Nimona. So we make Harey chane (green garbanzo beans) ka nimona, kale chane ka nimona, mung ka nimona and so on. 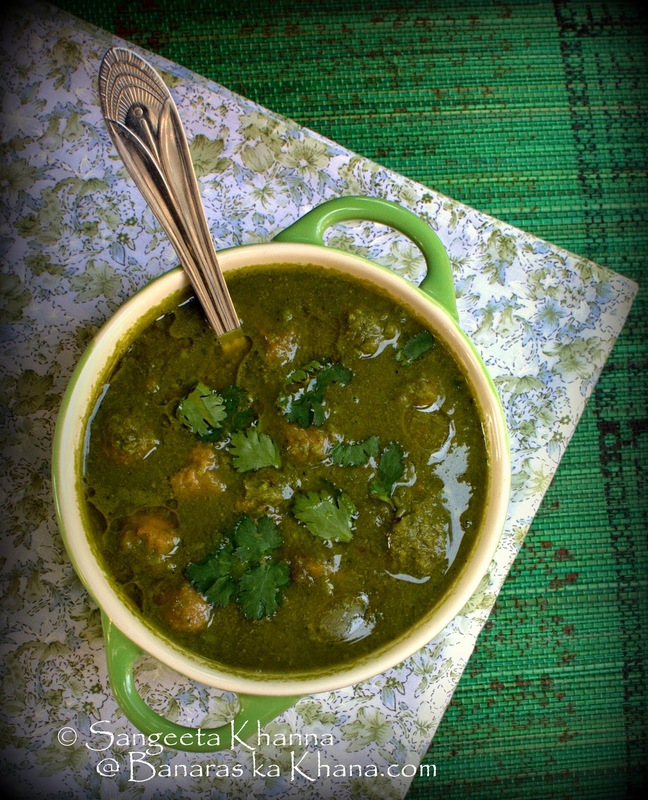 Some people even make a palak ka nimona that is simply a paste of steamed spinach leaves that makes the curry thick and creamy, some fried lentil dumplings, green peas and seasonal vegetables like cauliflowers or beans are added to this palak ka nimona. First of all put the peas, ginger and green chillies in a grinder without water and make a coarse paste so that some of the peas are left whole, keep aside. Heat ghee in a non stick pan or a cast iron one, put in whole jeera n tejpatta, then add the ground peas paste when the jeera splutters, fry this on low heat for 5-6 mins, then add the powders. I don't use haldi so that a rich green color comes, it is optional and you can add haldi (turmeric powder) for it's medicinal values, it wont affect the taste of nimona. Add salt and keep frying on low heat until a nice aroma mixed with the smell of ghee starts coming, add 2 cups of water. Less water if thick consistency is needed. Cover the pan and give it a boil, it is ready after 2 minutes. Garnish with chopped coriander leaves and serve hot. The aroma and taste is so amazing that nobody can guess matar ka nimona is so simple to make, moreover, a minimum amount of masala allows the flavour of the peas to take over. 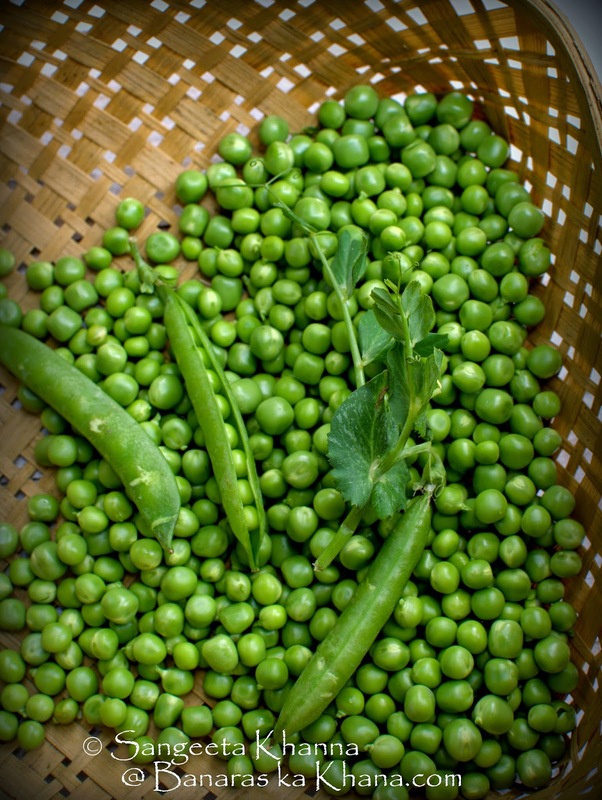 The freshest green peas make the best matar ka nimona. Since there is no onion garlic in this recipe it can be eaten on fasting days when evening meals are allowed. 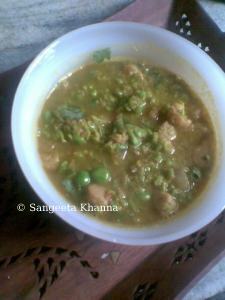 Now towards the other recipe of matar ka nimona using frozen green peas. Frozen green peas don't normally have the subtle sweetness of the fresh peas and the mature peas mostly are a little more starchy than fresh ones. It needs a little more potent spicing than the fresh green pea version of matar ka nimona. Grind the peas coarsely as the above recipe and keep aside. Heat ghee in a pan and put in the jeera n tejpatta and let it splutter, now put in the onions and fry till translucent. Add the ginger garlic chilly paste and fry till ghee separates, now add the powder masalas and fry till aromatic and finally add the tomato paste and salt, add the potato pieces at this time if using. Other ingredients will be added later. Fry a bit and add the peas paste, keep frying for 3-4 minutes, add 2 cups water and soya nuggets or paneer or fried mung wadi, cover and cook till done or when ghee comes on top, garnish with coriander leaves and serve hot. Edited to add : another matar ka nimona with mungodi (fried mung dumplings) can be seen here. First time visitor....Recipe sounds new to me....Looks yum. I am from U.P and and nimona chawal is one of my fav dish,my mum used to make it, loved it in winters. thanks for sharing the variations of nimona. I know hoe UP people love this nimona, I like it with chapatis too. Thanks Anonymous, let me know if you cook the recipes. I am from Andhra but my husband is from UP. I have made this today. Hope he likes it. Most people in Banaras add Cauliflower and Potatoes to Nimona!Love it with dollops of ghee and hot steaming rice! !Thanks for posting the recipe. Welcome to my blog DC. Yes I had forgot that, thanks for reminding..may be I'll make it with gobi and aloo withing a few days. My mom used to add gobi aloo to nimona. delicious & easy to prepare light food. even a working man can prepare. I just loveeeeeeee nimona chawal. As i am from UP(allahabad) but my husband is sindhi. it makes me remember my mom's nimona. She cooks it just amazing. Thanks for the recipe. Love it in Winters. I just love Nimona with chapati and steamed rice.Its my one of the favorite food. Loved it. I have linked what I made to your place. Thanks we loved it. Its a new thing to us but it will go to be a regular at home. Thanks for the appreciation and for the alert as well Payal. I am so used to this plagiarisation that it doesn't surprise me at all now. What to do? Just made this (the first version of the recipe, without aloo). I put in some nutrela for protein. Wow. Delicious! Full of flavour even with no hing, onion or garlic. Well I have been reading your blog for quite some time but being busy I just tried Nimona , very good , FYI, I added boiled white cholle in to that and the garnish of raw onions, green chilly and lemon.I keep on trying few recipes once in a week at home on sundays but mostly with non veg.Recently I made egg yellow in the rice paper with the salad.Well please accept my compliments on the Ginger , Tulsi and Jaggery Shinakji you taught. That was fantastic. Served Chill. Regards. That was a different matar ka nimona for sure Manoj :-) Thanks for the feedback. That tulsi jaggery and ginger shikanji is my favourite too.